On average, you can eat for cheap in Thailand, and when I mean cheap, I mean cheap. This of course depends upon your ability to figure out what's good or bad. If you go to a sit down restaurant in a mall, your costs will go up by quite a bit. As of 2012, the exchange rate between the Thai Baht and the USD is just about 30 baht per dollar. If you spend 300 baht, it's about 10 dollars. In a mall, you can get dishes in the range of about 150 Baht, which is roughly about 5 dollars per meal. Your costs can go up by quite a bit though, depending upon what it is. 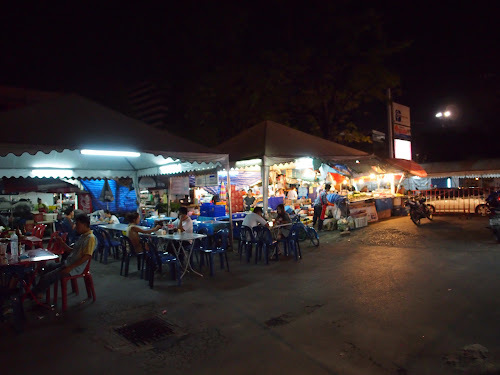 How about regular Thai food on the street. The venues are often supersized versions of street food carts. Street food rules in Bangkok. 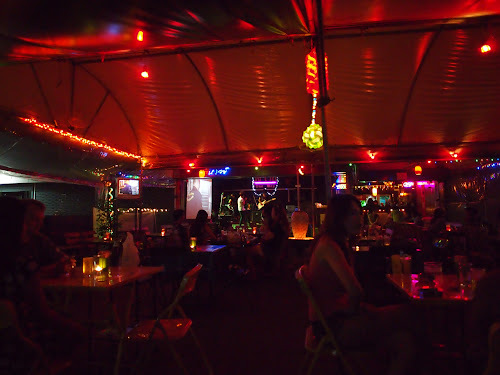 With local venues, the kitchens are often open air, and you sit underneath fans on plastic chairs and plastic tables. Even the indoor restaurants often have outdoor kitchens. Local Thai food is roughly about 30 to 60 baht per dish. Essentially one dish is about a dollar. Some dishes, if you are splurging, can go up to 2 dollars per dish. Now, if you are into eating a variety of dishes, then you are in the foodie heaven of all heavens. Now, if you are a food safety Nazi, then some aspects of this country will irk you. The kitchens often do not have hot water. You will often see people washing dishes on the sidewalk. Many of these places do not have a restroom. Even in the mall, the restroom is located away from the restaurant. The safest thing is to go to places that are crowded, or go to places that a local recommends. Now if you are on a tourist run, the local recommendations might be a little hard. My suggestion would be to use The Lonely Planet guides. They tend to recommend places that are tourist friendly. They are good starting points if you don't have access. Fortunately for me, I have Thai friends who can order for me. This place serves mainly Issan food. Issan is a northern style of food, and it is most often associated with papaya salad, larbs and other dishes. It is the cuisine that many in the USA might be the most familiar. As a rule, the further south you go, the chili count goes up. 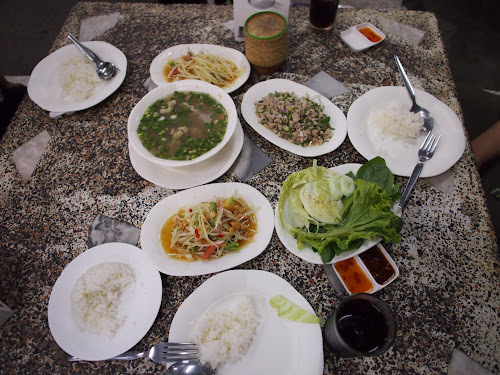 Now, this spread contains 2 papaya salads (one spicy, one mild), rice, sticky rice, larb, a hot and sour beef soup. They will always serve it with some cabbage, Thai basil and a raw bean that makes for good snacking. Total costs for this spread would be about 8 dollars if you go by the idea of each plate being 60 baht. And yes, it's good eats. Here's a rundown on some of the dishes we got here. Issan style pork slices. These cuts are thinly sliced with a layer of pork fat. The dipping sauce is spicy, although I can't tell you what's in it. This was really good, and quite tender. 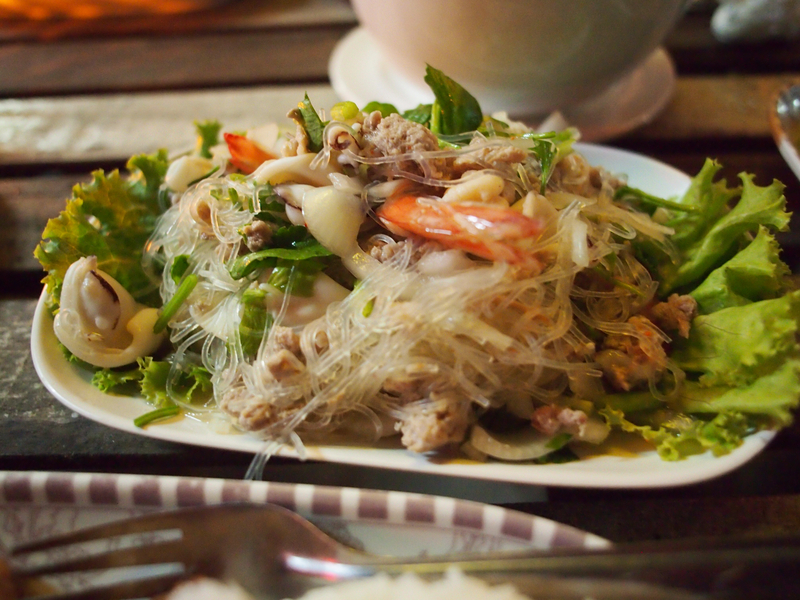 Larb. This again is pork larb, which is laced with chili, lime juice, and fish sauce. Onions are a part of this dish. It's quite a bit better than the stuff in Los Angeles. 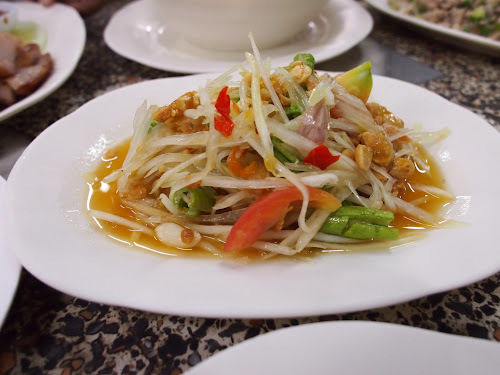 Papaya salad. The one I ate was spicy with chili. The long beans in this dish are facinating, and crisp. This dish had peanut brittle in it, which gives the salad the sweetness often delivered with palm sugar. 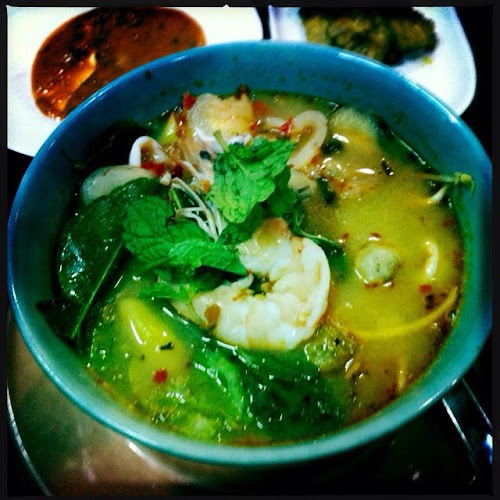 Although Bangkok is a huge mega-city, Thais tend to live, to eat and to go out locally. When I stay in Thailand, I stay close to my high school friend, who lives in the Ramkhanhaeng area by the Thai Sports Authority. It's a location away from the bustle of Sukumvit, which can be a zoo. There is a parking lot area by Ramkhanhaeng University that has a number of venues. This particular area is often called Centerpoint. Generally, all of these places play Thai music to patrons who stay up late, eat and drink. Most of these venues put up canopies, folding or budget chair and tables, and serve enormous amounts of alcohol. Thais enjoy themselves. They drink; they eat; they stay up very late. Very late. This restaurant/bar is called One Way. In fact, because I don't read Thai, I just know a place by location only. If you look direcly across from One Way, you can see a vast array of plastic table and food and drink being served. This location becomes really active after sundown. During the day, it is very quiet. Thais come out to eat and to meet with friends quite often during the evenings. A sidebar fact . 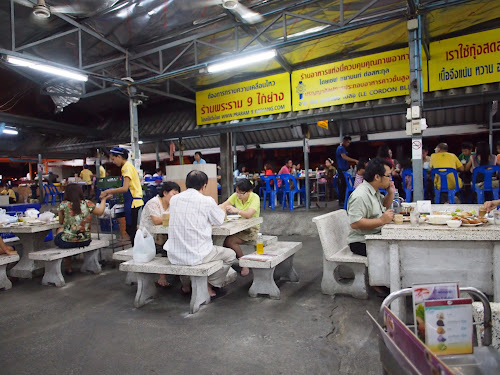 . . it is rare to see Thai people eating alone. I eat alone, and often someone just sits next to me out of sympathy. Very interesting in terms of culture differences. So, what types of food can you get at a place like One Way? Some of the best food I've had has been prepared in these types of places. Here's a rundown. This is an interesting dish. It's marinated pork that has been thinly sliced. Some of it is so thin, that it reminds you of really good Thai pork jerky in LA, but it's much better. When I mean by thin, I mean paper thin. You may recognize this dish. It's a seafood and pork salad. It has those translucent thai noodles mixed in which chili, lime, fish sauce with I think a touch of Thai basil. You can order this dish from mild to Man Vs Food challenge levels of chili goodness. This is an interesting beef dish. I can tell that it is deeply marinated. The beef chunks are deep fried into some fatty goodness. I don't know where the cut is coming from, but the texture is chewy in a good way. It's sort of an interesting type of gastropub type of food that you snack on while having a beer. There are also local places that serve lunch. 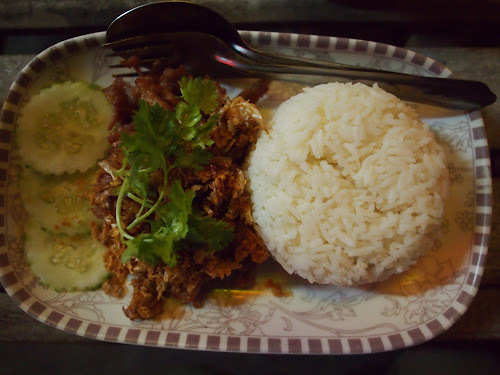 The prices range from 30 to 60 baht per plate. Next to my apartment here, there is a local place that specializes in these really cool Thai dishes. They already know my pattern. I order a plate. I get a Pepsi. I tip them 10 baht. They also remember me. This is an example of some of their dishes. This is stewed chicken with noodles and veggies. It was really good, and surprisingly light. This was not a bad dish. The broth is dark, and the vegetables are fresh. 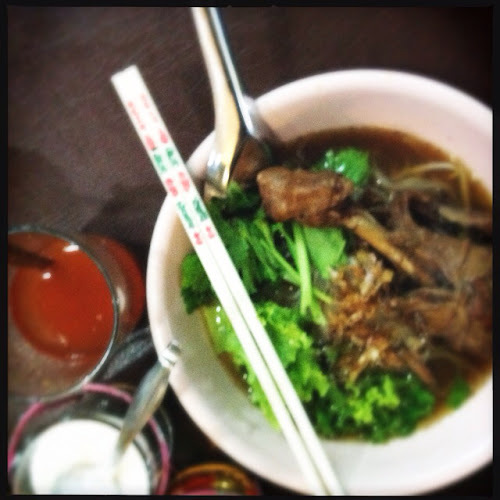 The drumstick was laced with the soy sauce goodness of the broth. These two shots were done with the Hipstamatic app in the iPhone. I've had this soup the second day here. It's spicy with lots of chili. The shrimp was great and the noodles were tasty. A few things were identified by my palate. Coconut milk, chili, fish sauce, galangal root and probably lemon grass. Unfortunately, many of my food pics are on the iPhone. Bangkok is interesting. The concept of free Wifi is nonexistent here. 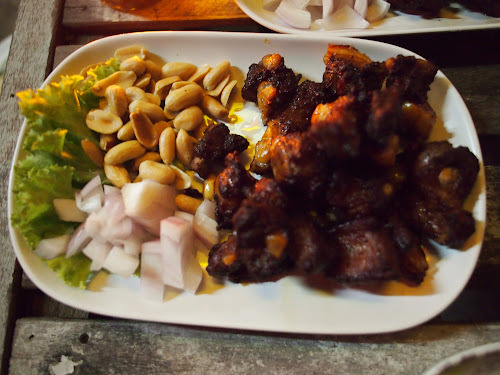 For Photo Stream to work, I need a Wifi connection, and I may have to update more pics ironically when I am in Hanoi, which is another major foodie destination. I've done a temporary work around using the iPad as a hotspot, uploading to Facebook then downloading the pics. Not very efficient.